↑ Kaplan, Lawrence. 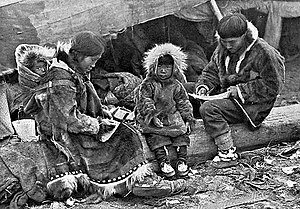 "Inuit or Eskimo: Which name to use?" Alaskan Native Language Center, UFA. Retrieved 14 Feb 2015. ↑ "Eskimo: Usage." Oxford Dictionaries. Retrieved 27 Jan 2014. ↑ "Eskimo." The Free Dictionary. Retrieved 27 Jan 2014.